Charles Brandon was one of Henry VIII’s best friends. He was born circa 1484 to Sir William Brandon and Elizabeth Bruyn, and his father died carrying Henry VII’s standard at the Battle of Bosworth in 1485. It is thought that Brandon grew up in the household of his uncle, Sir Thomas Brandon, a leading courtier in the reign of Henry VII. By 1507, Brandon himself was serving the King as an esquire of the body. Although he was seven years older than Henry VIII, Brandon became the King’s lifelong friend, and was made Duke of Suffolk in 1514. He was forgiven for marrying the King’s favourite sister, Mary Tudor, Queen of France, in 1515, without the King’s permission. 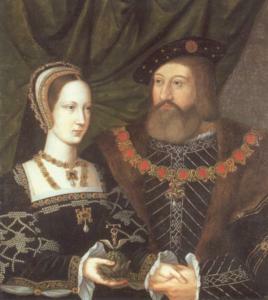 The couple had four children: Henry, Frances, Eleanor and a second Henry after the death of their first son. Mary died in June 1533 and their second son died in 1534. Brandon married for the fourth time in September 1534; his new wife was his 14 year old ward, Catherine Willoughby. Brandon had poor relations with Anne Boleyn, his sympathy being with Catherine of Aragon. Suffolk was prominent as the King’s lieutenant in suppressing the rebels of the Pilgrimage of Grace in late 1536, and in 1537 he moved to Lincolnshire on the orders of the King. In December 1539, he led the party which met Anne of Cleves at Dover and was also involved in sorting out the annulment of the marriage in 1540. In the early 1540s, he was involved in Henry VIII’s wars with Scotland and France, serving as the King’s lieutenant in the North from 1543-1544 and then leading the siege of Boulogne in 1544. He died on 22nd August 1545 at Guildford. His cause of death is unknown. He was laid to rest in St George’s Chapel, Windsor Castle, on 9th September 1545. Unfortunately, his sons, Henry and Charles, died of sweating sickness in July 1551. Just wondering who Charles Brandon’s other wives were …we know about the Kings sisiter and katherine Willoughby his 4th wife but who were wives 2 and 3 qn what happened to them . There’s a real mess for you….in fact, there were questions about the legitimacy of his marriage to the French Queen that Wolsey got sorted out…..he was betrothed to and repudiated Anne Browne in favor of Margaret Mortimer, whom he then left, returning to Anne Browne, actually marrying her this time….after her death, he was betrothed to his ward Elizabeth Grey, and she was dumped for the French Queen…..this would have made a wonderful storyline for The Tudors, and it would have needed no alterations…..along with Margaret Tudor’s three marriage, what fun it would have been! Brandon was quite the bad boy, and got away with far more marital hijinks than the king. They are listed as Margaret Mortimer and Anne Browne on Wikipedia. Brandon was actually a distant cousin of Henry’s, through the Wingfields, back to the FitzAlans, who were descended from Robert of Gloucester, illegitimate son of Henry I. There were other connections as well, but this is the easiest to trace. I am always amazed at the little information and writings on Charles Brandon. Aside from Prince Edward, he was pretty much the only person that never fell from grace of Henry; not even his own children were always in favour. He secretly supported Catherine, disliked Anne, married the King’s sister…but was forgiven for all. People were beheaded for less than that during Henry’s reign. I think he most certainly fed the King’s ego and obeyed him, but also he was the only person resembling a friend for Henry, and the King didn’t want to lose him. Is he this Charles Brandon – https://www.historyofparliamentonline.org/volume/1509-1558/member/brandon-sir-charles-1521-51? That Charles was the illegitimate son of Charles Brandon, Duke of Suffolk, by Elizabeth Pigot, daughter of Thomas Pigot of Clotherholme and widow of Sir James Strangways of Harlsey and Whorlton.